A day before the start of yet another trial brought by the Bolloré Group against French journalists, organisations denounce the imprisonment on February 5th of six local community leaders affected by the investments of Socfin Agricultural Company Sierra Leone Ltd (SAC) (1), a subsidiary of Socfin, linked to Bolloré. 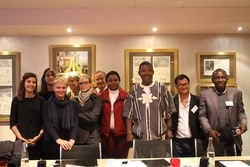 A year ago, Shiaka Sama was invited to Paris by the Bolloré Group to find a solution to the conflicts linked to the exploitation of plantations in Africa and Cambodia by subsidiaries of Socfin. Today, he is behind bars in Bo, the second largest city of Sierra Leone. Five other activists have also been incarcerated, after being found guilty of destroying 40 oil palm plants. The six activists, who deny the charges, are members of the Malen Affected Land Owners and Users Association (MALOA). Unless they can pay a fine ranging from 6,500 to 13,000 Euros per person, they each face five to six months in jail.